London, 30 Dec 2024. The UK coast guards rescued a drifting boat last night with 900 illegal immigrants on board off the coast of Selsey Bill on the south coast of England. This follows the landing last week further east at Bognor Regis when 350 people were brought ashore, and the shipwreck off the Channel Islands earlier in the year when over 400 people were drowned. 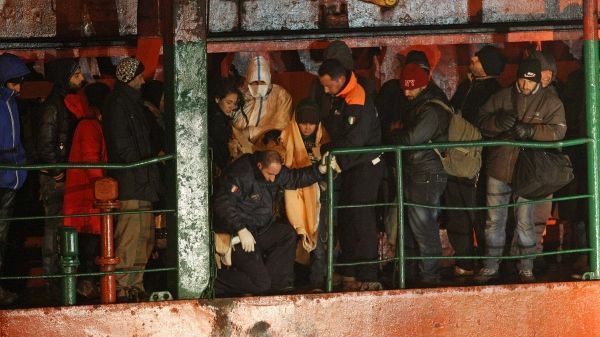 The local police in Selsey are still trying to identify those on board –among them 22 pregnant women and 20 unaccompanied children – most of whom are thought to come from countries torn by civil war in the Baltics or trying to escape the authoritarian regime in Russia. This year some 70,000 immigrants were rescued from boats drifting off on the south coast of England. This imaginary scenario a decade hence might seem impossibly surreal to a northern European reader. But substitute the names of the English coastal towns with Italian ones and this is what is happening now, all along the southern coast of Italy, in Puglia, Calabria and Sicily. The island of Lampedusa – visited by Pope Francis at the beginning of his pontificate and where 366 boat people were drowned in October 2013 – is no longer the only location struggling with these tragedies. * Now illegal immigrants (when did the term “boat people” – now rarely used – transform into “illegal immigrants”?) are landing at previously unheard-of destinations. 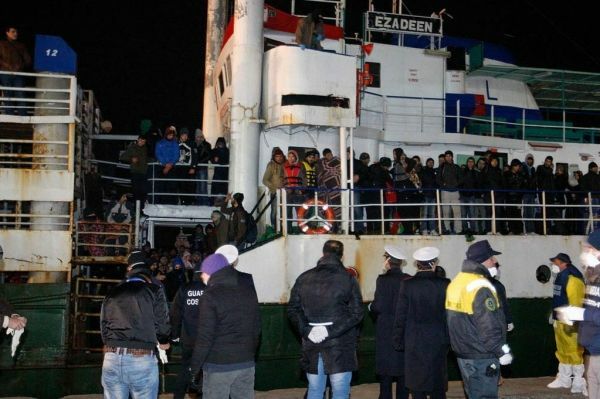 For example, at the beginning of January the cattle ship Ezadeen disembarked 356 frightened people in Corigliano Calabro, a previously anonymous small town on the Ionian coast about 50 km from Cosenza in Calabria. Add Bari, Brindisi, Gallipoli, Lecce (principal destinations for those fleeing conflicts in Syria and beyond), Agrigento, Augusta, Ragusa and Siracusa (end of the line for those coming from sub-Saharan destinations and in particular from Eritrea), and this is the measure of what is happening across Italy's southern coasts. Last year the Italian navy brought over 100,000 people to safety from boats in difficulties, but another 3,419 drowned before reaching land, making the Mediterranean one of the most tragic seaways in the world. Italy's rescue operations were considered a success but in financial terms (around €9 million a month) the government found them unsustainable. In November 2014, Operation Mare Nostrum was replaced by Triton, a new programme for policing people-smuggling in the Mediterranean, under the command of Frontex, the European border agency. Patrolling the Mediterranean has now been internationalised; in the process, the cost has been slashed to €3 million a month. Arguments for and against Mare Nostrum and Triton focused on whether rescue (the Mare Nostrum policy) or deterrent (Triton's brief) is the better strategy against transporting people illegally across the Mediterranean. But the numbers (1,155 people were disembarked in Italy in four days at the beginning of January**) show that the debate is academic. Desperate people are still coming from desperate places, even at the most treacherous time of year for the journey. These hazardous sea crossings are only part of a long odyssey, just as the sea rescue is only the most dramatic and visible part of what Italy is now having to organise. The processing system set in motion once the terrified human cargo is landed is organised by the ministry of the interior. It involves identification, health controls, security checks, immediate emergency accommodation, provision of clothes and food and then onward transport to holding centres across the country. The ministry now has a well-defined structure of differently graded centres. There are four in the south for those who have just arrived (centri di prima soccorso ed accoglienza, CPSA), at Lampedusa, Elmas (Sardinia), Lecce (Puglia) and Ragusa (Sicily). There are five centres for identification and expulsion (centri di identificazione ed espulsione, CIE), in Turin, Rome, Bari, Trapani and Caltanisetta. There are 14 holding centres for arrivals (centri di accoglienza, CDAs) and asylum seekers (centri di accoglienza e richiedente asilo, CARA), located throughout the country. Ministry figures show that at the end of December 2014 these centres were housing 66,066 people, compared with 22,118 at the beginning of the year. About half of the centres are defined as temporary structures, accommodating 35,499 people at the end of 2014. The majority were housed in Sicily (22 per cent), Lazio (13 per cent), Puglia and Campania (9 per cent) and Lombardia (8 per cent). The remainder are located mainly across the north. Alongside the administrative procedures, the judicial process to arrest and prosecute the traffickers is also set in motion once the vessels have docked. This is becoming more complex as the criminals become more skilled. The two landings at the end of December set a new pattern, with no identifiable crew on the drifting boats. Had the pilots jumped ship at some stage, leaving the boats out of control or on auto-pilot, or had they mingled with the passengers to escape detection? The two boats (Blue Sky M and Ezadeen) were at least registered – one in Moldova and the other in Sierra Leone – making some sort of tracking and accountability possible, which is not always the case. As recent crime investigations and arrests in Rome have indicated, illegal trafficking is now big business. In the crackdown on Rome's home-grown mafia in December, one of the criminals in the notorious Carminati gang is on record as saying that immigration is now more profitable than the drugs trade. From sea transport to final accommodation, criminals are creaming off fortunes along the way. As the investigations in Rome revealed, contracts for the construction of the much-needed holding centres are just the latest method the criminal networks have found to make money. These camps are also proving centres of attention in even more unpleasant ways. Not only are the physical conditions as temporary as the structures themselves – a sort of no-man's land that nobody wants – but they are also becoming the focus for anti-immigrant and racist rage. 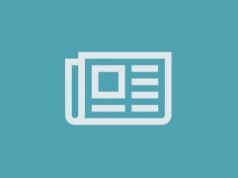 The scenes of hate and anger at Tor Sapienza, an eastern suburb of Rome, last November were particularly insidious because they were directed at a centre for young unaccompanied children, eventually forcing the transfer of 45 of these young people to other centres for their own safety. Unaccompanied children on migrant boats are a particularly serious problem. Of the 155 people who survived the 2013 Lampedusa disaster, 41 were children without their families. 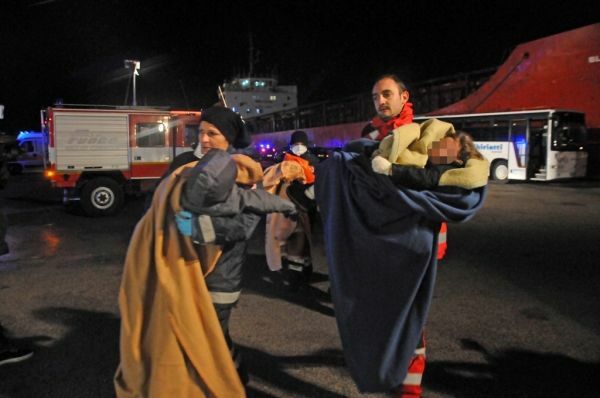 Of the 359 people who came ashore from the Ezadeen in Corigliano Calabro on 3 January, 62 were under-age and eight were unaccompanied children. Of the 796 people rescued from the Blue Sky M, “about 40” were children; so far it has not been specified how many were unaccompanied. What happens to these children and where do they go? One of the dangers is that bureaucratic and legal procedures can unwittingly make matters for them worse. Brothers and sisters can be separated, not just because of gender but also because of age: those under 17 have a different legal status to those 18 and over, and this can also lead to tragic separations. Religious and United Nations organisations are there to help, but in their desperation to escape bureaucratic entanglement minors are known to lie about their age and background or – even worse – drift off unnoticed, on the beginning of another equally dangerous journey. According to the latest ministry of labour figures, of the 14,000 under-age people who have landed illegally in Italy, 3700 (or 26 per cent) have “disappeared” Of the 4,628 minors who have landed in Sicily 1,822 (or 39 per cent ) have gone missing. *On 9 February 29 African migrants died from hypothermia while crossing the Mediterranean in extremely cold and dangerous conditions. **Since the time of writing at least another 588 people have been brought ashore in Crotone and Reggio Calabria. This article first appeared in the 4 February 2015 edition of Wanted in Rome.